AM-49: AM-49 was awarded to All American Aviation. All American Aviation (AAA) was founded in 1937 by the "du Pont" brothers (Richard C & Alexis F). AAA was successful winning the bid from the Post Office Department for the AM-49 air mail route. This award was predicated on the 1939 success of experimental air service (AM-1001 & AM-1002) which tested the feasibility of feeder lines to serve the smaller communities where airport facilities or volume of mail were insufficient to justify full air mail service. It would radiate from terminal city hubs and would utilize the rugged Stinson Reliant aircraft. 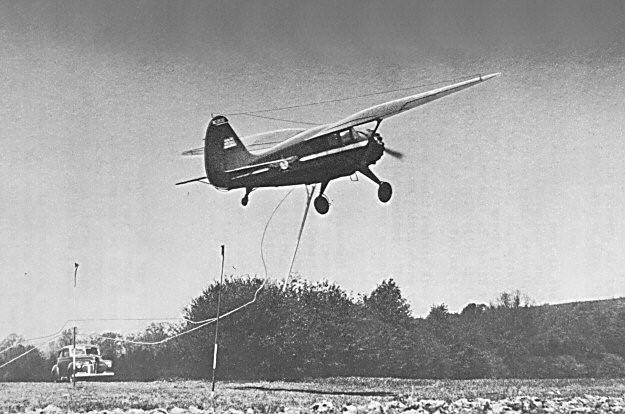 The Stinson was equipped with a long take-up boom with a hook and a winch that operated through an opening in the fuselage. The Stinson would swoop down snatching the container of mail suspended on a rope between two poles. This nonstop airmail pickup and delivery system was invented by Lytle S Adams who sold AAA his patent rights. In order to teach and familiarize personnel with this new procedure, AM-49 was actually inaugurated in five parts. Part A - August 12, 1940, November 2, 1940, May 7, 1941, & September 27, 1943. Part B - November 12, 1940, May 15, 1944 & April 29, 1946. Part D - August 12, 1940 & July 14, 1941. In January 1949 the discontinuance of this nonstop airmail pickup and delivery system was authorized by the CAB as it was becoming too costly for the benefits obtained. The last flight was flown on June 30, 1949 from Pittsburgh PA. It was replaced by regular air mail service under AM-97.